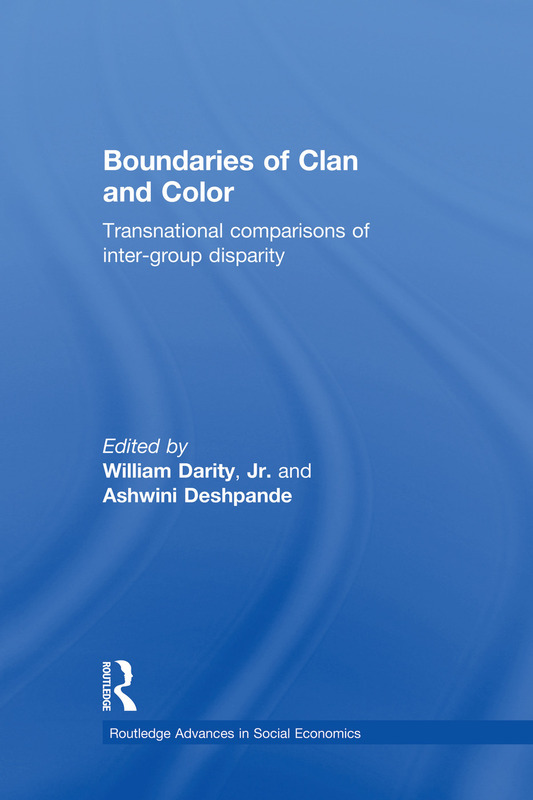 Under the impressive editorship of William Darity Jr and Ashwini Deshpande, this collection forms an important book. It will be of interest to students and academics involved in racial studies, the economics of discrimination and labor economics as well as policy makers around the world. 1. Ashwini Deshpande and William Darity Jr. Boundaries of Clan and Color: An Introduction 2. Peggy A. Lovell Race, Gender and Regional Labour Market Inequalities in Brazil 3. Morton Stelcner Earnings Differentials Among Ethnic Groups in Canada: A Review of the Research 4. Patrick L. Mason Understanding Recent Empirical Evidence on Race and Labor Market Outcomes in the USA 5. Samuel L. Myers Jr. If Not Reconciliation, Then What? 6. R. Quinn Moore Multiracialism and Meritocracy: Singapore's Approach to Race and Inequality 7. Ashwini Deshpande Recasting Economic Inequality 8. Jacob Meerman The Mobility of Japan's Burakumin: Militant Advocacy and Government Response 9. Faridah Jamaluddin Malaysia's New Economic Policy: Has it Been a Success? William Darity Jnr. is Boshamer Professor of Economics at the University of North Carolina and Research Professor of Public Policy Studies at Duke University, USA. Ashwini Deshpande is Senior Lecturer in Economics at the University of Delhi, India.